Concurrent causation is a legal doctrine that relates to property insurance. It applies when loss or damage occurs as a result of two or more causes, one of which is covered and one of which is excluded. These causes may occur at the same time, or one may occur before the other. For example, suppose that you own a building that you use as a commercial warehouse. A tropical storm blows through town, and strong winds damage the front of the building. 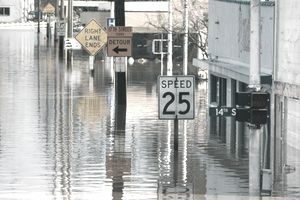 Heavy rain causes a flash flood and the front of your building also sustains water damage. It is impossible to separate the damage caused by the flood from the damage caused by wind. Your building is insured under a commercial property policy that covers damage caused by wind but excludes damage caused by a flood. Your building has been damaged by two causes, one of which is excluded and one of which is covered. Is the loss covered or excluded? Under the doctrine of concurrent causation, the loss would be covered. This doctrine holds that if a loss is caused by two perils, one of which is excluded and one of which is covered, the loss is covered. The theory of concurrent causation derived from decisions made by courts in California in the 1970s and 1980s. As a result of these decisions, ISO and commercial insurers revised their property policies to include anti-concurrent causation wording. This wording was designed to ensure that losses caused by certain perils would be excluded, even if other perils were involved in the loss. Most commercial property policies apply on an all-risk basis, meaning that the policy covers all causes of loss that are not specifically excluded. In most all-risk policies, including the standard ISO all-risk policy, exclusions are divided into two main groups. Only the exclusions in the first group are subject to anti-concurrent causation wording. The doctrine of concurrent causation applies primarily to all-risk policies. All-risk policies cover a broader scope of perils than named peril policies. A named perils policy covers loss or damage caused only the perils that are listed in the policy. Nevertheless, a named perils policy may still contain anti-concurrent causation wording. An example is the ISO Broad Form policy. While this form is a named perils policy, it includes the seven exclusions cited above. These exclusions are subject to the same anti-concurrent causation language found in the ISO all-risk policy. Suppose your property policy does not contain the anti-concurrent causation wording cited above. A building you own is damaged by both wind and mold. Mold is an excluded peril under your policy, but wind is covered. Will your loss be covered? The answer is maybe. Some courts do not apply the concurrent causation doctrine. Instead, they will determine which peril was the proximate (predominant) cause of your loss. If the proximate cause of your loss is deemed to be mold rather than wind, your loss will likely be excluded. If the court decides that the proximate cause was wind, then the loss should be covered.